Be enthralled by this unusual and special tour: close to Madrid there are two unique cities whose artworks and history are mesmerising. This is a tour that will immerse you in Spanish history. You will be amazed! This tour has been organised to show you two cities in central Spain: both timeless in their appeal, and both World Heritage sites. Don’t forget to wear comfortable shoes, sunglasses if it’s a sunny day, and to bring your camera! Within the imposing and beautifully preserved walls of Avila, time seems to have stood still and visitors are almost intruders. The mediaeval ramparts guard many treasures - Romanesque churches, mediaeval convents, and Renaissance palaces. 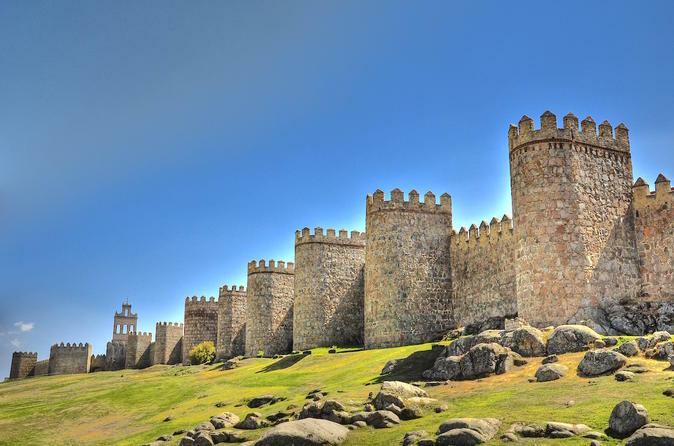 This cultural and historic jewel and its Old World ambience make UNESCO-listed Avila one of the most interesting cities in Spain. During the early mediaeval period, Avila was a prize fought for by Moorish and Christian rulers, until the Reconquest by Alfonso VI in 1085 confirmed its Christian future. Beginning in the 11th century the town was settled by many aristocratic families, and with its numerous palaces, the town became known as Avila de los Caballeros ("Avila of the Nobles"). However, the town’s cultural pinnacle was reached in the late 16th and early 17th centuries, when it became an important pilgrimage destination following the death of the famous mystic Carmelite nun Santa Teresa de Jesús. The natural setting is also inspiring, as the town stands on a high plateau sheltered by the rolling hills of the Sierra Gredos Mountains. Segovia too is a legacy of the past now displayed in a modern but inspiring setting. originally a hilltop settlement, this historic walled town with its stunning views and magnificent monuments, is a precious gem. Its Roman aqueduct, its fairy-tale castle, its awe-inspiring cathedral, and its exquisite Romanesque churches and mystical monasteries are witnesses to a rich cultural heritage. Segovia is a fount of complex history, from the Romans of 80 BC to the medieval Moorish period, and then to the coronation of Queen Isabella "the Catholic" in 1474. The majority of Segovia's attractions are found in the Old Town, a preserved mediaeval world of cobbled streets, tortuous alleyways, and hidden squares. As well as discovering the better known attractions, you should wander the narrow pedestrian lanes to find artisan boutiques, cafés, confectionery shops, and restaurants.